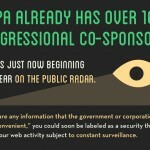 This week CISPA was reintroduced in the House of Representatives. 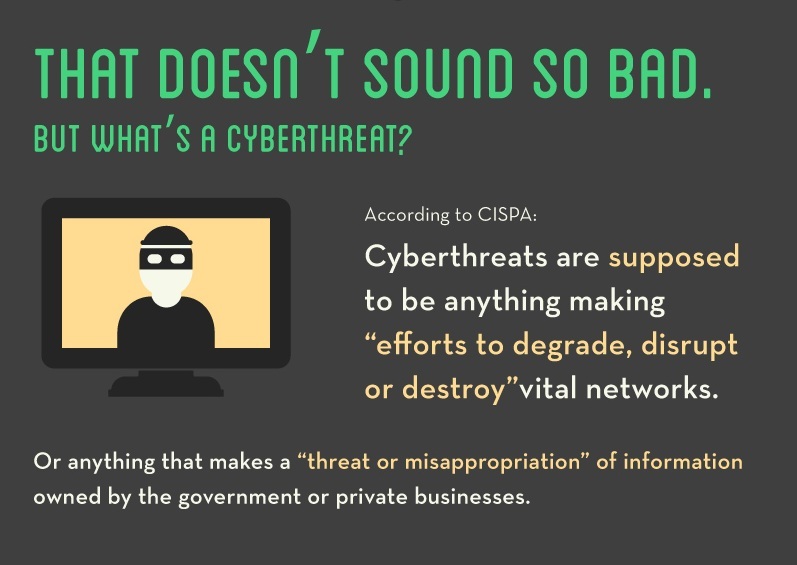 Last year, tens of thousands of concerned individuals spoke out against overbroad and ineffective cybersecurity proposals. Together, we substantially changed the debate around cybersecurity in the U.S., moving forward a range of privacy-protective amendments and ultimately helping to defeat the Senate bill. Lawmakers will vote on the bill as early as Wednesday, April 25th or Thursday, April 26th. 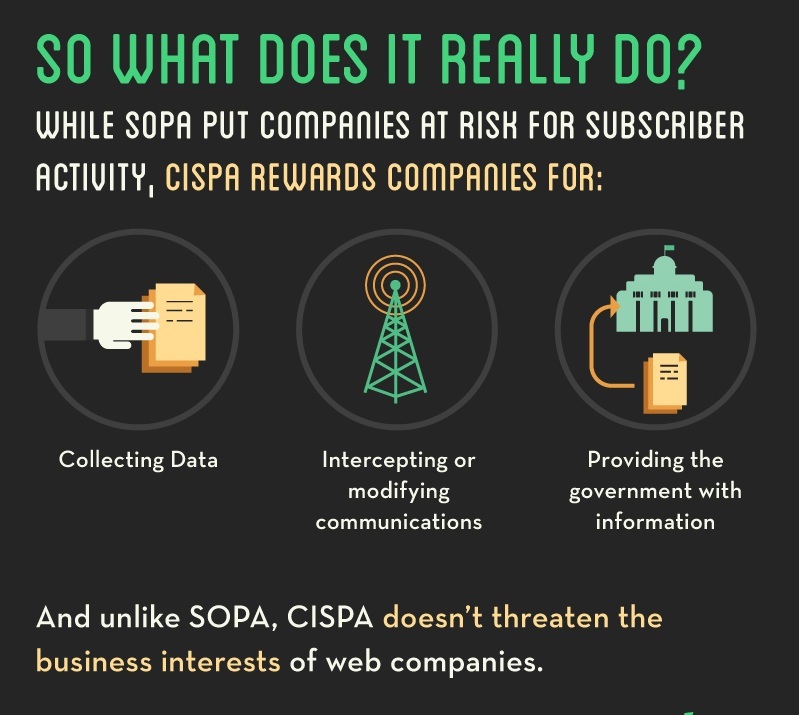 “SOPA was about intellectual property; CISPA is about cyber security, but opponents believe both bills have the potential to trample constitutional rights,” writes ProPublica’s Megha Rajagopalan. But, both have to do with the way you use the Internet and both threaten user privacy. This bill has nothing to do with copyright and online intellectual property. It would do more than just shutdown your favorite overseas pirates. 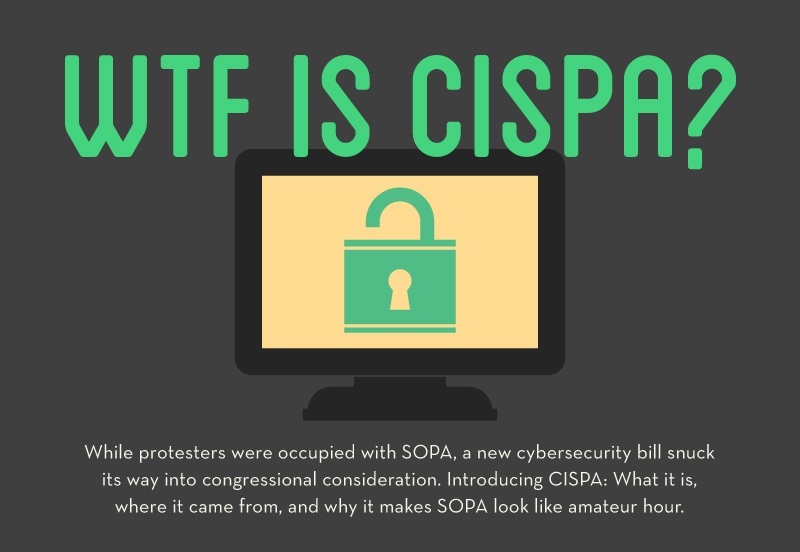 But like SOPA, in the name of some loftier goal — in SOPA’s case copyright, in CISPA’s case cyber-security — CISPA gives the government your Internet. 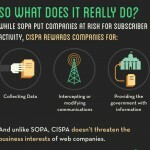 With SOPA, this meant censoring the Internet. 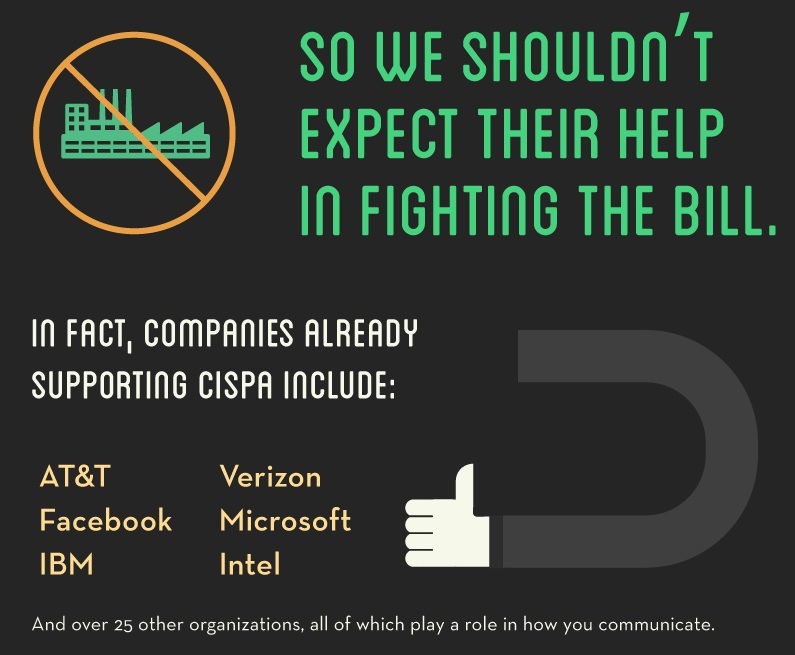 CISPA, however, gives companies many Americans use, like Facebook and Twitter the ability to hand over your information to any government agency. 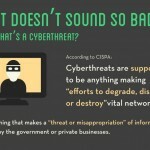 CISPA says companies need to give up your information only in the face of a “cyber threat.” So, what is a “cyber threat”? Nobody really knows! The bill defines it as “efforts to degrade, disrupt, or destroy government or private systems and networks.” In other words, trying to do bad stuff on the internet, or even just talking about it. Ideally, this would be narrowed to specific malicious LulzSec stuff like DDoS attacks, but it’s not. It can be almost anything! 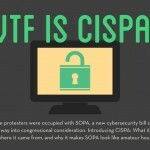 CISPA is deeply flawed. 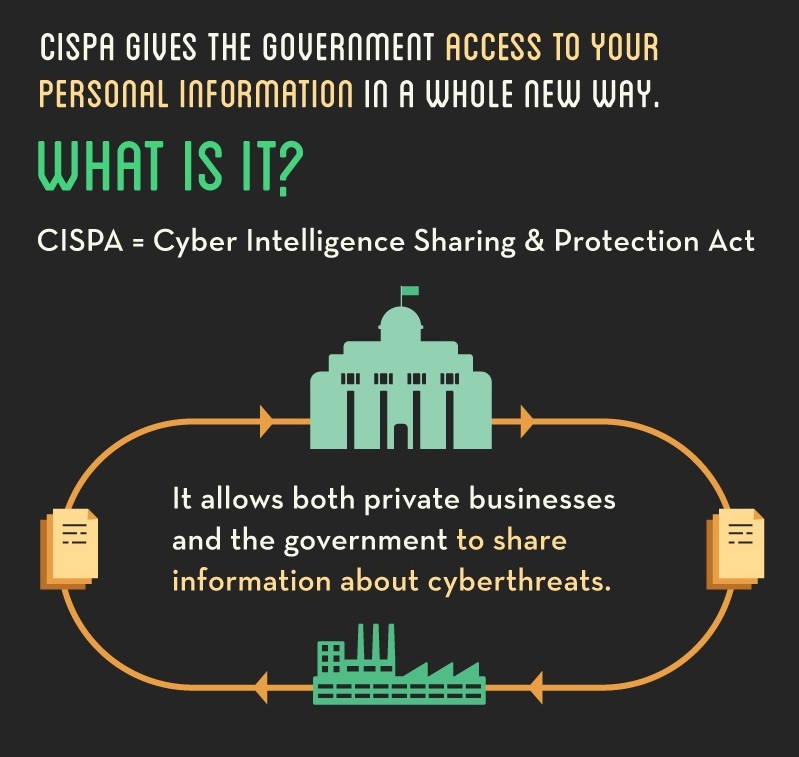 Under a broad cybersecurity umbrella, it permits companies to share user communications directly with the super secret NSA and permits the NSA to use that information for non-cybersecurity reasons. This risks turning the cybersecurity program into a back door intelligence surveillance program run by a military entity with little transparency or public accountability. Experts from the financial industry and the business roundtable confirmed that it’s possible for them to remove data that identifies users from cybersecurity data before sharing it with the government. 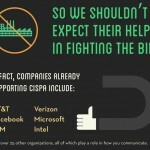 However, as CISPA is currently drafted, companies wouldn’t be required to ensure that identifiable user data was stripped out. 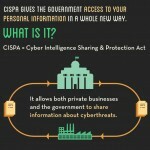 Under the current proposal, “cybersecurity threat information” may be sent directly from companies to the government. 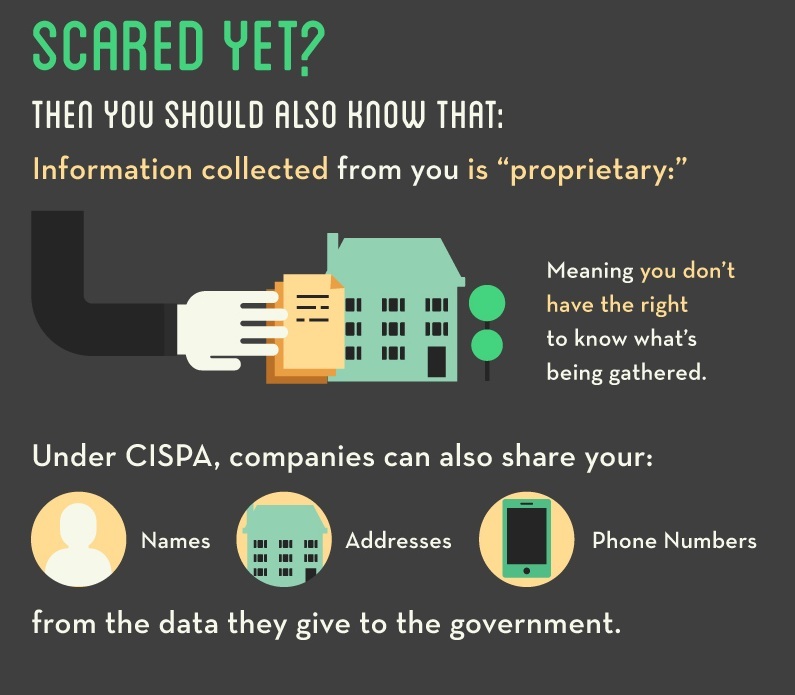 Companies are under no requirement to strip out personally identifiable information of users before sending it along, and there are broad immunities granted to companies who share more data than is necessary to communicate a cybersecurity threat. Take action… contact your local representatives to tell them that you do not agree with this bill and they shouldn’t either. 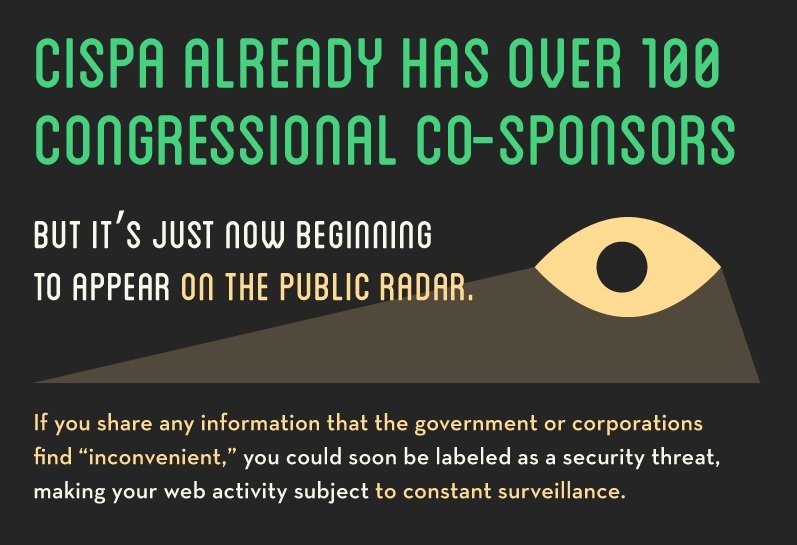 The EFF is joining groups like ACLU and Fight for the Future in combating this legislation. Need to know who your representatives are? Just use this. Use the EFF’s online form to automatically contact your representatives via EFF. Seriously, this is simple you just go to the EFF site, input your zip code, and you have a pre-formatted message to send. It takes maybe five minutes of your time to do this — make the effort. It will certainly be worth it.